Switzerland is one of the richest countries in the world with a gross domestic product (GDP) per capita of $59,536 in 2015. It's also known as one of the most politically neutral countries - with no wars since 1815 - and competitive economies in the world. These attributes have granted the Swiss currency a safe-haven status in the financial community. The Swiss currency - known as the Swiss Franc (CHF) - is the national currency of Switzerland and Liechtenstein. As of 2016, the Swiss Franc is the sixth most traded currency in the world, accounting for around 5% of global foreign exchange transactions. And, the USD/CHF currency pair remains one of the most traded currency pair in the world. In this article, we will take a look at the Swiss currency and its safe-haven status, as well as some controversial moves by its central bank. The Swiss currency has been a long-time safe-haven investment in the financial community. For instance, the European sovereign debt crisis led to such high demand for francs that the Swiss National Bank (SNB) was forced to peg its currency to the euro - at a rate of 1.20 euros per franc - to prevent its own economy and export sector from suffering. As opposed to other safe-havens like gold, the Swiss currency is readily available on a large scale, highly liquid and backed by the robust Swiss economy, which itself is seen as the world's leading banking center. As a result, many institutional investors and governments are particularly fond of using the currency for this purpose, while retail investors are largely focused on other assets. 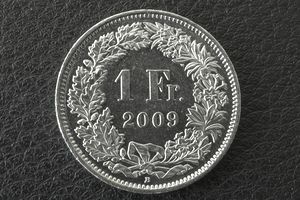 The Swiss franc's safe-haven status was tainted in September 2011 when it pegged the currency to the euro in order to stabilize its economy. In the aftermath, many large foreign exchange brokers and investors faced billions in losses and were declared insolvent. Some investors are hesitant to invest in Swiss fancs given the unpredictability of the central bank. Those looking to invest in Swiss currency can do so the easiest with exchange-traded funds (ETFs) that trade on U.S. stock exchanges. The most popular Swiss currency ETF is the CurrencyShares Swiss Franc Trust (FXF), created by CurrencyShares, which is designed to track the price of the Swiss franc relative to the U.S. dollar. Easy to Purchase - ETFs can be purchased using traditional brokerage accounts and shares trade daily on the NYSE Arca. Prudent Margin - ETFs are eligible for margin accounts, which means that investors can leverage their positions, but less so than typical currency spot market leverage. Lower Cost - ETFs are traded as securities, which means that transaction costs are significantly less than currency spot market transactions. The spot foreign exchange (forex) market is another option for buying Swiss currency. These transactions involve borrowing one currency (A) to buy another currency (B) and then closing that transaction for a profit or loss at some point in the future. A profit is realized when currency B increases in value relative to currency A, while losses are generated when the opposite occurs. In the forex market, the most popular Swiss currency pair is the USD/CHF. Traders that are bullish on Swiss currency will "sell" or "short" this currency pair - effectively reversing the order and using U.S. dollars to buy Swiss francs. Of course, this is done at very high leverage of up to 10,000:1 in order to realize a profit on small pip movements (fractions of a cent). Swiss currency is seen as a safe-haven investment within the financial community, while the franc is the sixth most traded currency in the world. In particular, institutional and sovereign entities prefer to purchase francs due to their high liquidity and availability. However, the Swiss central bank's unpredictable actions in 2011 have made some investors hesitant. Long-term investors tend to prefer Swiss currency ETFs, while short-term investors may instead consider the spot foreign exchange (forex) market. But either way, investors should carefully consider the risks - particularly when using leverage - before committing any capital.